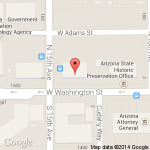 Meetings are held at 1740 W. Adams, Board Meeting Room B, Phoenix, AZ unless otherwise indicated. Meetings begin at 1:00 p.m., although occasionally the time or date may be changed as the result of a meeting falling on a state holiday. A final agenda is posted 24 hours in advance of the scheduled meeting time. Recordings of Meetings can be obtained by contacting the Board Office. If you desire accommodation, such as a sign language interpreter please contact the Executive Director at (602) 542-3095 (TTY 711 for relay service relating to the hearing impaired). Please make your request as early as possible to allow time to arrange the accommodation. *Reserved for teleconference board meetings, but can be changed to live meetings.